Check for an email from Seedrs Support which provides you with a direct link to your campaign dashboard. Check for an email from Seedrs Support which will prompt you to create a password and set up your Seedrs investor account. You'll be asked to choose your account type (entrepreneur), create your investor profile (includes a short multiple choice quiz about investing in startups) and then verify your identity. Once you're signed up then you can access your campaign following the instructions above. 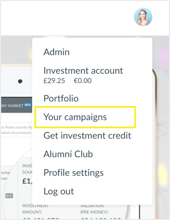 *Note that you can exit your investor profile setup at any time to get started on your campaign, however you will be required to create an investor account for our team to verify your identity for the team section of the campaign page.